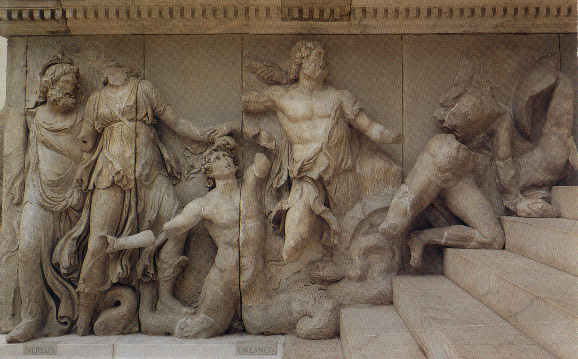 This Ionian Greek altar decor at once reveals the struggle between the Titans and the Gods, but also suggests that the Greeks at Pergamon, where the altar resided, were conveying a message of why new belief systems were needed as this triumph of sky deities over thonic or earth deities, like Gaia depicts. The importance of such a struggle was symbolic and appealed to the emotions of the faithful. Ideology is best thought of as an expression of political faith in the power of ideas to alter social arrangements, institutional power, organizational frameworks and governing elites. The underlying beliefs are in contrast to the way the world actually behaves. All people are to be trusted with the capacity to make decisions that affect their lives. The mass of people are to be feared because they are prone to emotion, uncontrolled temperament that leads often to violence and dissolution of public order. Ideology has become a form of "radical intellectual depravity." Ideology involves meaning, the expression of ideas to convey that meaning and a cultural context in which that meaning is understood. Ideology as a product of the prevailing spirit and customary references of the times and can thus be used as a political rallying point. Ideologies then take the place of traditional religious, monarchical, and military authority because the power those institutions once exerted over political discourse, social organization and individual behavior has deteriorated. The meaning of symbols is manipulatedmeaning of symbols is manipulated by ideological parties because "cultural symbol-systems are extrinsic sources of information" about the world. They come from outside of a culture from other cultures and can or are adopted according to the needs of a particular sociaety and the demands of that period of their historical situation. Ideologies are figurative, symbolic and imaginative appeals to our emotional desires to believe in larger than life possibilities and are at once an expression of hope and a reflection of our despair. Technology, because it is political, generates an ideologically persuasive slough of symbols, metaphors and even creates unseen, yet very revered rules of conduct.